Jennifer Cluff: Fab free flute concert online - Hutchins, Hoeppner etc. Fab free flute concert online - Hutchins, Hoeppner etc. 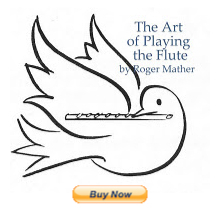 A wonderful online free, (to-listen-to-or-download) flute concert featuring flute solos, duos, quartets/quintets and some fabulous new flute ensemble arrangements. The quality of the recording is EXCELLENT! Check it out. Can listen to entire, or select pieces individually.